There is no doubt of my love of chinoiserie, but the blue and white palette seems to make it even better! 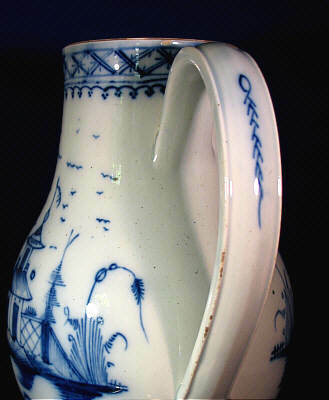 The simplicity of colors ....the blue just pops against the creamy white background. 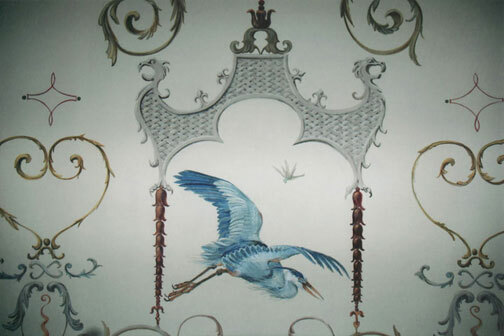 Many elements of chinoiserie motif can be drawn from ceramic designs. 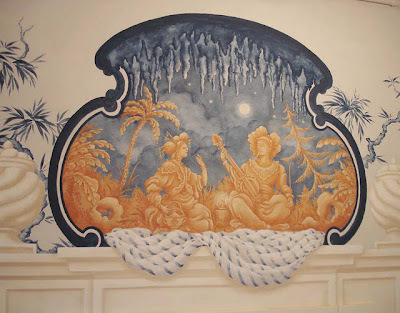 Michael Duté's chinoiserie murals always delight me! His work reminds me so much of intricately painted porcelain. 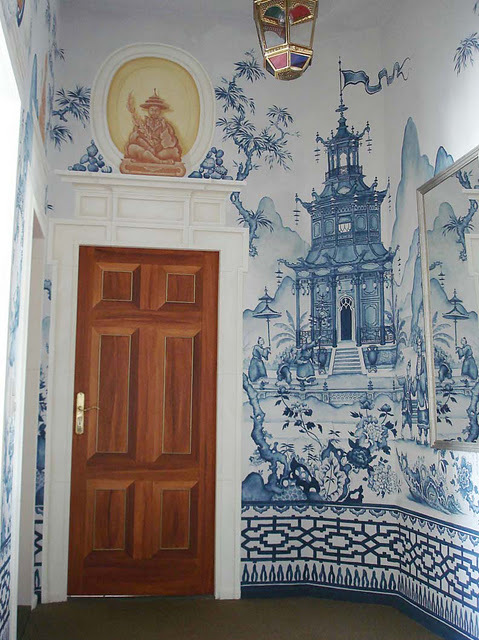 The work of Irish artist Michael Dillon also features some incredible blue and white chinoiserie. Wedgwood, delft, chinoiserie...all blue! 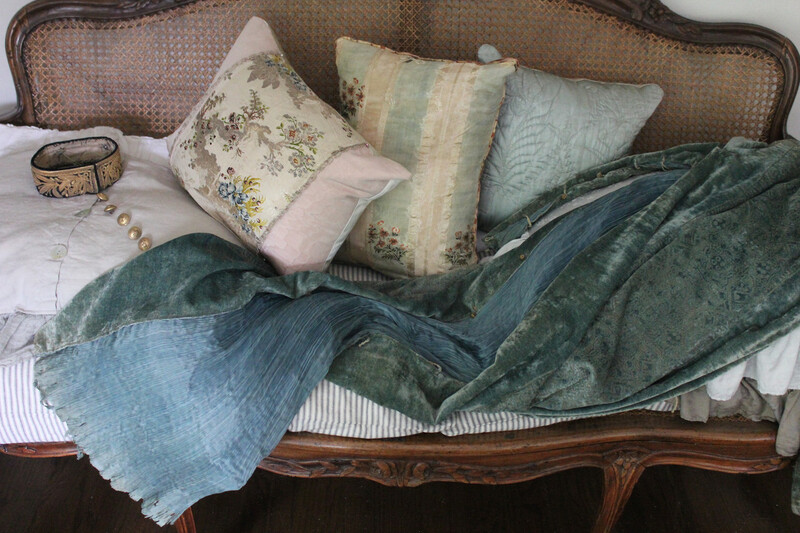 Blue is soothing..it reduces stress by lowering blood pressure. I think that is another reason I am so drawn to it! Theresa, gorgeous, yes blue & white always a classic! I would love to see more of your works of course! 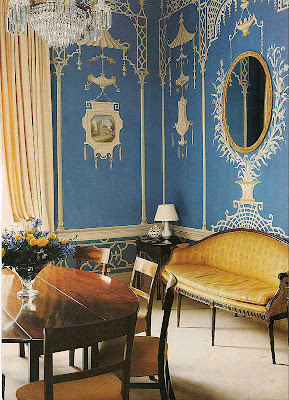 'I find it harder and harder to live up to my blue china' ... Oscar Wilde. 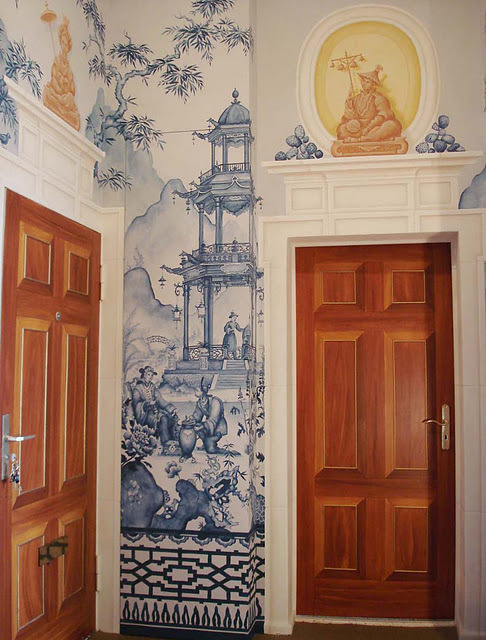 Maybe if he had you create one of those fantastic blue and white murals, he wouldn't have felt like that. Hi, Theresa - Thanks for introducing me to the work of Michael Duté. The two views of the example you show are great, and I think the little bit of warm color that he introduces over the doors is a brilliant and needed relief. 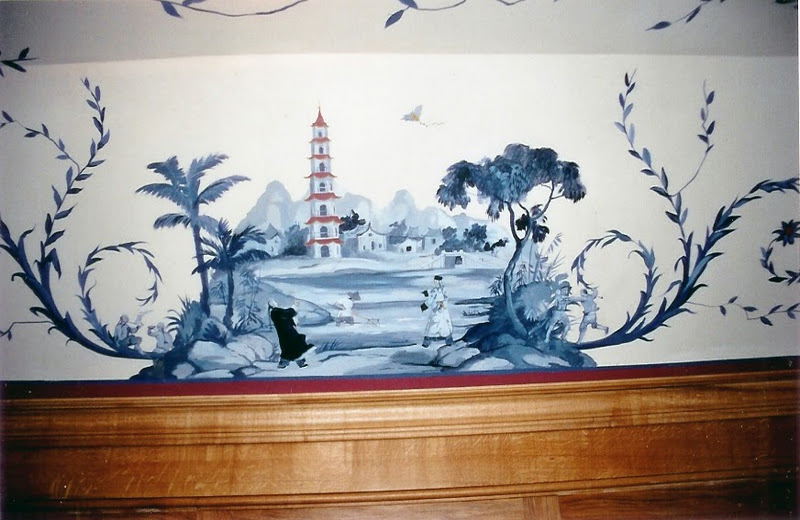 I've always wanted to do a painting that was a take-off on the Willow Pattern, and this is pretty darn close. Mark-I love Duté's work also. I agree about adding the warmth, I want to do this too! Thanks for introducing me to new artists too, Theresa. And I love that Oscar Wilde quote by Patrick! I'm listening to the Forsythe (sp?) Saga as I work, and time and time one of these Victorian characters picks up a blue and white tea cup from a collection, and occasionally smashes it in their hands. Sort of a leitmotif, a symbol of the delicacy of relationships and the brutality of ownership. How beauty can be easily smashed. 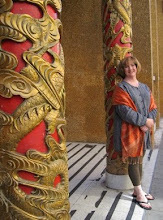 Theresa, I do love love your blog and know how much care and sensitivity to beauty goes into it. My mother loved Delft and blue and white.....just reading this made me miss her. 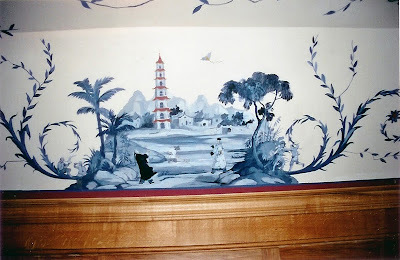 For many years I have been wanting to stencil either my kitchen or dining room with a giant version of our willow pattern border. I wanted this to be around four feet high in shades of grey, blue and white. 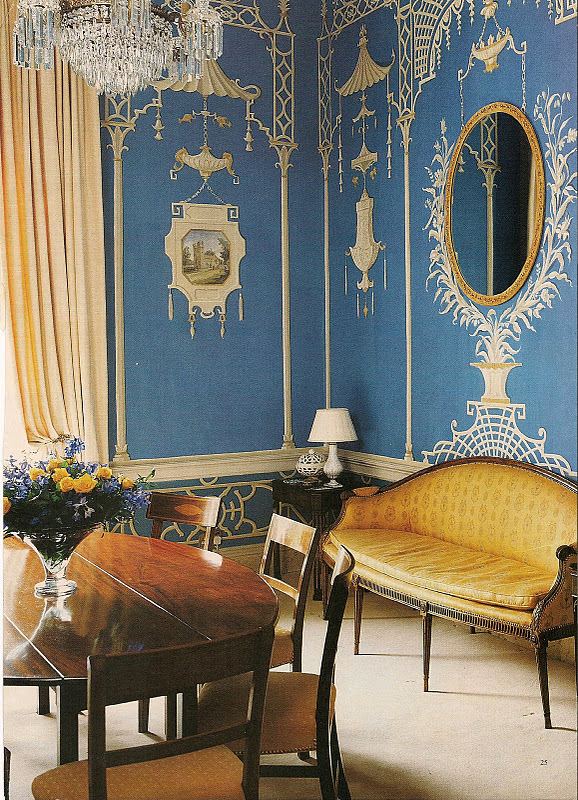 Seeing those beautiful walls by Michael Dute has strengthened my resolve to do so. 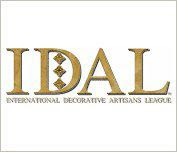 All thids is so i,teresting, I discover your blog with great pleasure and will come back, thank you! !